Mixed Feelings Dazed Thoughts: Of Thana Fatehganj, stories of dacoits and a Chandela temple! 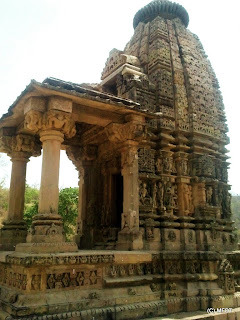 Of Thana Fatehganj, stories of dacoits and a Chandela temple! Just as things were beginning to look up after the Bhatta-Parsaul imbroglio and and I was looking forward to settle down in my life in Noida, before the sun could set on 30 June 2011, I received the marching orders for Unnao. People in office were jubilant and could not stop congratulating me for the first charge of a district, the happiest moment in a civil servant's career. I, however, as is always the case with me, was too dazed to be able to comprehend and react. The district headquarters of Unnao are a mere 50 km from the Lucknow airport and mid-way between the cities of Kanpur and Allahabad. In terms of connectivity, few districts in UP have had it so good. Being unhappy over such frequent change of places, I had little option but to book the ticket for Lucknow. Before however I could hang my boots in Noida and could handover my responsibilities officially, the orders were cancelled and I was instead posted to Banda. The same notes of congratulation immediately turned into sympathy and regret and few even advised me to scuttle the order by proceeding on leave. The advice was flowing in thick and fast and the impression I was given was as if I had been sent in exile to some dacoity-infested forest land where life is uncertain and for a woman even more so. 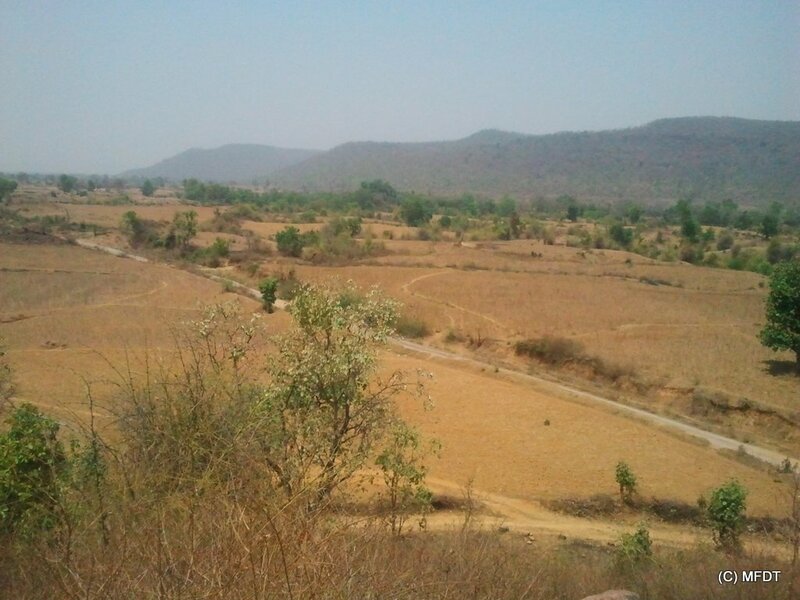 Surprisingly, even in the administrative quarters, people with considerable experience consider Bundelkhand (especially Banda) a kind of punishment and merely bide their time. There was little one could do and without any pre-conceived notions in my mind, I arrived in Banda on the sultry afternoon of 4 July, 2011. 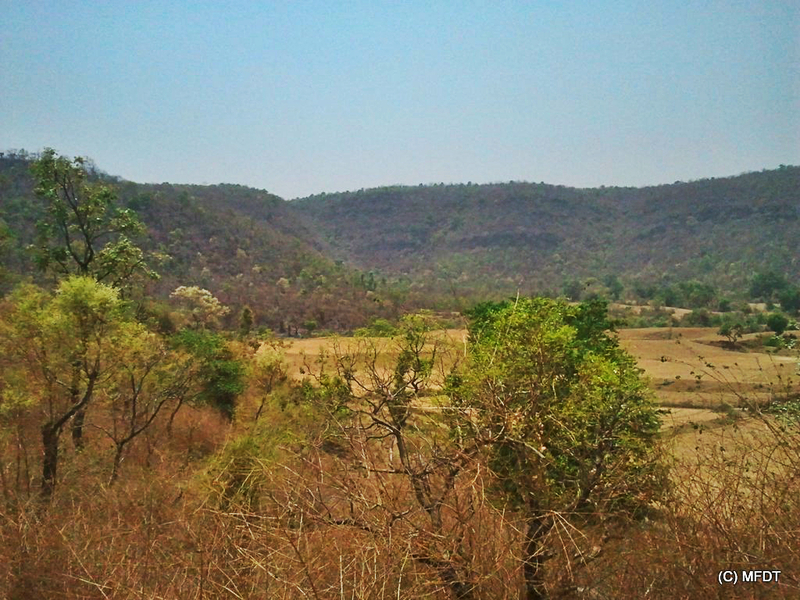 Growing up in Delhi, the sense of space and time, given the remoteness of Banda was a liberation of sorts and the first time I looked at the rivers, the fields and most importantly, the low hills, I knew nothing could have been better! Even today, looking back at our time in Bundelkhand, me and A wouldn't trade it for anything in the world. Yet in an important Election Commission meeting, to my utter surprise and dismay, a senior official was furious at the state machinery for posting a woman in a dacoity-infested land and for him given the past incidents in the area, Assembly elections were doomed to be anything but peaceful!! No wonder, the policies for the development of this region are often made with the same pre-conceived notions and thanks to our media's sensitivity (read sensationalization) isolated incidents become forever entwined with the image and character of the people of a place. It was with this background that I was presented the story of Thana Fatehganj (Village Dadwa-Manpur) where dacoits are believed to rule the roost and people (read government officials) are afraid to go even in broad daylight. 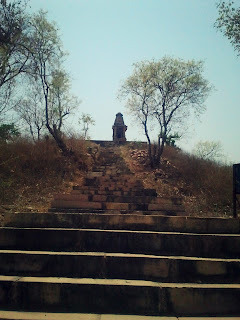 It was here on the fateful day of 23rd July, 2007 seven policemen were killed by the dacoits in an ambush near Kahlua Mafi forest and since then fear and insecurity loom large in the minds of the residents of nearby villages of UP and MP. Sporadic incidents of dacoity and murder continue to happen and the area has been traditionally infamous as a stronghold of dacoits all over the country. Surprisingly, while naxal-infested districts have well equipped Thanas (police stations) all over the country, this Thana which covers a large geographical area doesn't even have a boundary wall and a regular electricity connection. Needless to mention, the remoteness and poverty of this place have rendered it unviable even for our state run BSNL to erect cellphone towers and connectivity therefore, is as much a matter of chance as life and its related necessities. So much so for the development! It was here on a routine visit to Thana Fatehganj, my fellow SP, G, invited me to the Memorial police has built in the memory of those who lost their lives in 2007. 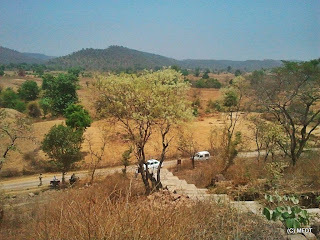 The fact that the area is surrounded by low forested hills on all sides and is scarcely populated must have been of strategic advantage for the dacoits who are known to inhabit the forests nearby. 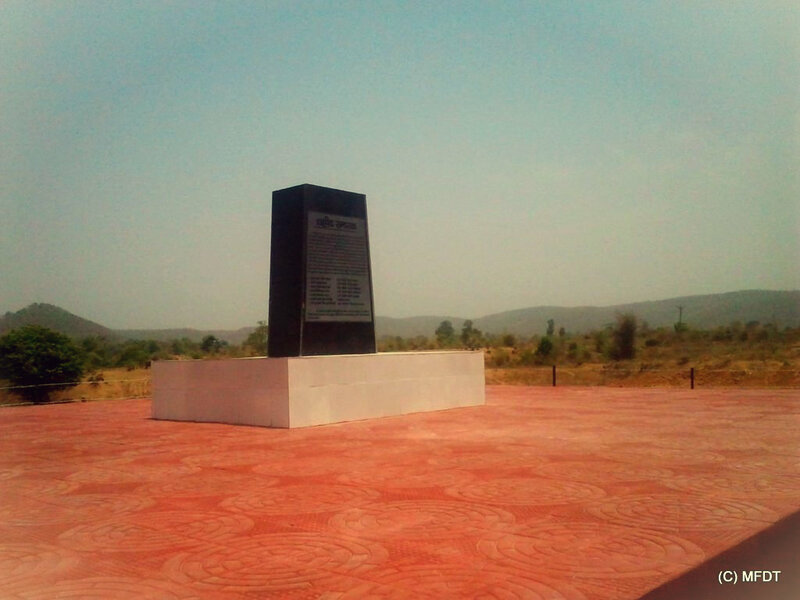 Today, the Memorial stands on the spot of the encounter in the middle of nowhere and bears a silent testimony to those who have laid down their lives fighting for an unknown cause in this inhospitable terrain. Having reached that far, the police officer in-charge-of-the-station requested us to also visit the ruins of a nearby old temple locally known as Bilariya Math. 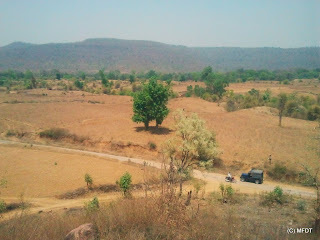 The road (dirt track) leading to the temple was a narrow and desolate one. 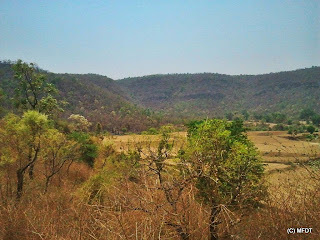 The only people we saw on our way to the temple were a motorcyclist and the staff at the nearby forest check post. 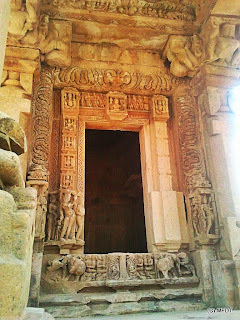 I specifically noted the presence of the check-post thanks to the visible accumulation of a large number of historic carved stones and figurines in its compound. Hopefully, the relics will not be conveyed any further than that. Surprisingly however, there was a government school just opposite to the temple and on enquiring it was found that on rare occasions when the school opens, the only person who comes to teach the kids is a poorly paid ill educated matriculate tutor hired by the school-teacher! 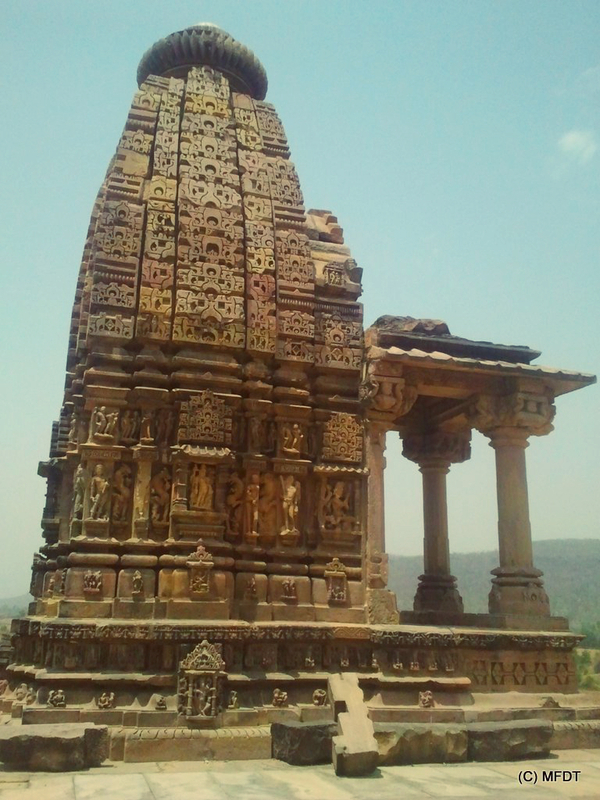 The temple was reached by a flight of stairs while its 'shikharam' can be seen from a good distance. The stairs were in a good state of repair but a huge number of artifacts and figurines lay strewn about. The temple chowkidaar (watchman) hired by ASI (Yes! its a protected monument) only appeared after fifteen minutes or so and was completely nonchalant about the existence of the monument altogether. Without any insistence whatsoever and certainly none in material terms, he seemed easy if we were to carry any number of artifacts or carvings along, as long as we could bring our own mode of transport! The single shrine which stands intact today is richly carved and bears striking similarity to the temples at Khajuraho. At some point of time, the temple must have formed part of a larger temple complex given, the foundations and perimeters of certain other structures are clearly visible even today. The temple offers superb views of surrounding countryside and must have been an idyllic location for prayers and devotion. 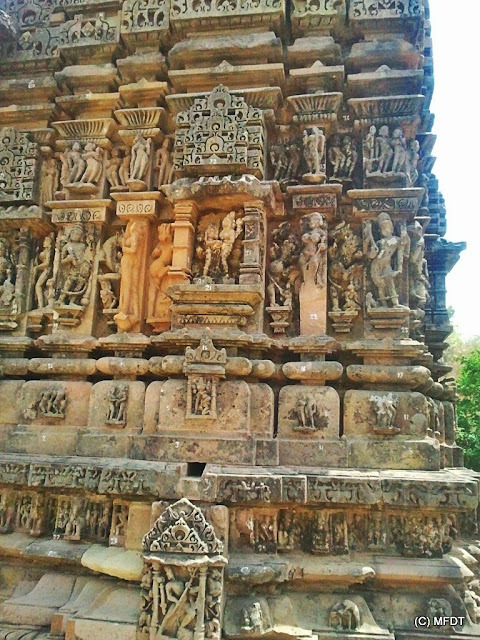 The carvings seem to confirm the Chandela period origins of the structure and hence the similarity to the ones at Khajuraho. 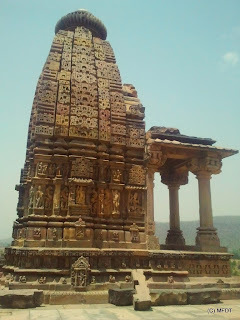 Across the temple on a nearby hill top are said to be the ruins of Madfa Fort with a pancha-mukhi rock-cut sculpture of Shiva. Legend has it that both Kalinjar and Madfa, situated atop nearby hilltops, were built on the same night. The team of artisans on both forts had a bet going as to who will finish the fort first.It was decided the one who finishes first will light a torch and the other will immediately stop work. It is said that the artisans in Kalinjar dropped their tool and lighted a torch to find the same. However, the torch was misunderstood by the team at Madfa, who immediately stopped work and the fort remains incomplete till date. Thanks to good light, I could click some pictures of the temple even with my obsolete 2 MP camera- phone. That very day, I found a very old District Gazetteer of the undivided Banda District in my husband's official library in Chitrakoot. 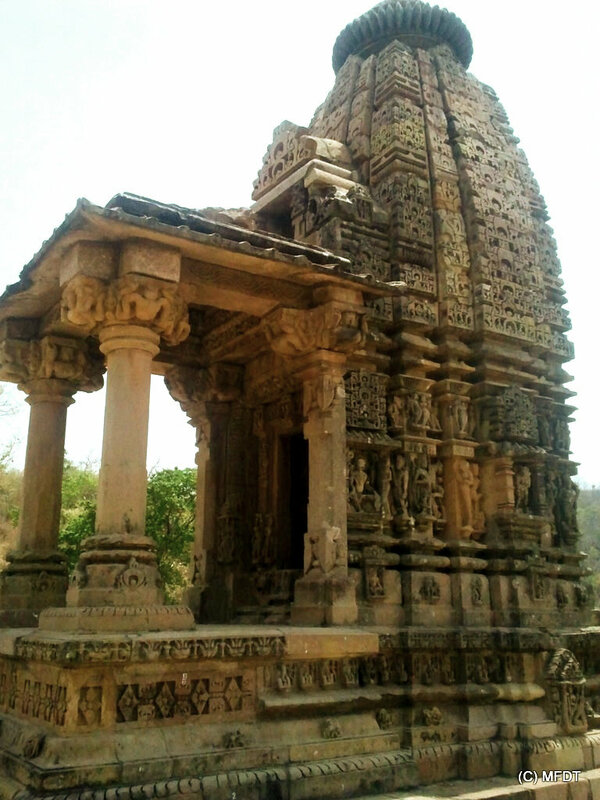 Even the document mentions a Chandela temple in the village Dadwa-Manpur. However, the temple rarely finds mention in any discussion of the region anymore. It is not even a temple in the truest sense of the term any longer given an empty sanctum sanctorum which it seems could not stand the ravages of time.. Even today when I look back at villages like Dadwa-Manpur, I wonder what hope and future do the residents have. In a place where basic amenities of health and education are still a far cry and people's horizon are limited, forget girls, even boys must be finding it difficult to imagine a life different from those of previous generations.I even remember stories of people turning down alliances from villages which lack a 'pucca' road or houses which do not have a cemented floor. In Banda, people do not marry into a family or invite those in marriages who lack a fire-arm. I knew of several such villages in Banda and Chitrakoot which continue to languish in a time warp and have little to build their dreams on. There must be thousands of such villages all over this country, each with its own set of 'dacoits' to live with and each with its own unheard prayer of a better future for their children. I hope things will change for better in my own lifetime and place like these will witness development in real terms but till that happens, remote villages such as this will continue to be infested by dacoits of ignorance, illiteracy and poverty..
BEAUTIFUL... Both the history of the place and your description. The last portion rings truth in every word! Lovely story S. The pictures seem to be popping out of a Jayashankar Prasad story, nicely woven into a Benegal movie. And yet the abject poverty around. Isn't that the case of India - art looks good only in fiction.